"DII Home Essentials 100% Polyester, Machine Washable, Shabby Chic, Vintage Tablecloth or Overlay 63" Round, Vintage Lace Cream"
Organize your important mail with this attractive and functional holder. Features pretty scroll work and mesh with an antiqued finish. Adds a nice little decorative touch to a desk or table. 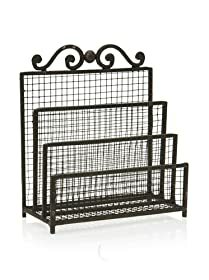 Measures 6.5″ H x 5.75″ W x 3″ D.
Made of metal with decorative mesh and scrollwork.